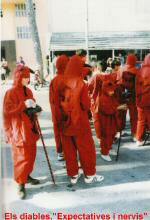 Towards the year 1989, a group of people from the Public School Sebastián Elcano del Grao of Castellón, began to work together to make possible the creation of a "ball de dimonis".Thus, the "Dimonis del Grau" made the first performance at the Carnival of Grau in 1990 with great success. 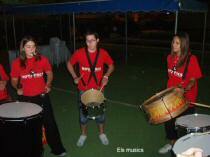 We expanded our expectations by creating a percussion group and participating in many events in Castellón: Lighting of the "Gaiatas", the "Cabalgata de Reyes", the "Festes per la Llengua". The new expectations led to the creation of a cultural association that exceeded the existing areas, while continuing to work together. Thus, in 1993, the "Botafocs" group was born with members with no age limit and covering a larger geographical area. Botafocs was growing with people from different cultural backgrounds, participating in fire parties, patron saint festivals, as well as organizing different manifestations of popular culture.